Plenty of tech startups have funneled out of the sunny metropolitan city of Jacksonville, Florida — dubbed the “next Silicon Valley” and a “hidden jewel” for entrepreneurs, according to business trend forecasters. The city is home to businesses large and small, from Firehouse Subs and Bubba Burger to Stein Mart, St. Vincent’s Medical Center, and the company in question, Web.com. Web.com is based out of Jacksonville, Florida, home to CSX Corporation, the Nemours Foundation, and Winn-Dixie. Here, we’ll cover the monthly costs and annual fees associated with Web.com. Though the company is known for an intuitive website builder, the team touts full-service web hosting solutions, including domain name registration, SSL certificates, site design, SEO and marketing, and the web hosting itself. How Much Does Web.com Cost? First, I’ve outlined the gist of Web.com’s pricing below. If the highlights are all the convincing you need to sign up for Web.com, cool! If not, read on for our breakdown of the monthly and annual estimates for web hosting, site building, domains and emails, and security and marketing tools from Web.com. Web.com is somewhat famous in the web hosting community for an über-appealing introductory offer. Once upon a time, it only cost 50 cents to sign up for one of the company’s basic website builder plans. The price point has escalated somewhat since Web.com was founded in 1997. However, the initial signup rate is still pretty spectacular. In the hosting industry, it’s pretty standard for providers to throw in a complimentary domain name registration. This is especially true of shared hosts, as their customers include first-time site owners who want a clear path to the content creation part of the hosting and site-building process. Some hosts include a free domain for the first year, while others provide a free domain for the life of the account. Web.com falls in the first camp. Unfortunately, the company’s fee to renew your domain registration is pretty ghastly. Our recommendation: Use Web.com as your website’s launch pad. Enjoy the introductory rates, build a custom site or have one built for you, and plan on migrating to a more cost-effective domain host before your website’s first birthday. While you’re with Web.com, however, do take advantage of the domain privacy add-on that’s suggested during the domain request process. It costs just under $2 a month to hide the personal information associated with your site from web users, so if anonymity is important to you, this is a worthwhile feature. The website builder arena is where Web.com really shines. The Jacksonville, Florida-based company is most known for the easy-to-use, drag-and-drop site builder included with the purchase of any hosting plan, as well as the custom website creation service conducted by developers. The first route is self-explanatory. Sign up for any web hosting plan and enjoy the code-free, WYSIWYG simplicity of Web.com’s intuitive site editor free of additional charge. This tool is great for the do-it-yourself-ers out there. For the non-coder who doesn’t have the time or the interest to go the DIY route, Web.com offers a done-for-you website service in which an expert will create a custom, professional site for your business or personal brand. You can call 1-855-886-3065 for a free consultation before having a mobile-responsive, SEO-friendly WordPress site made for you. An increasing number of web leaders are encouraging site owners to employ SSL security for their online brands. SSL stands for Secure Sockets Layer and refers to the security protocol that encrypts traffic transmitted between a server and web browser. By purchasing an SSL certificate for your website, you help ensure privacy and protection for your site and its visitors. Lately, the industry buzz has centered around the trust you evoke from your site visitors who see the lock symbol as a sign of trustworthiness. You can purchase one of these trust indicators through Web.com. Certificate deals start at $24.99 per year, with the option to upgrade to certificates that cater to multi-domain owners and coverage suited to enterprise. 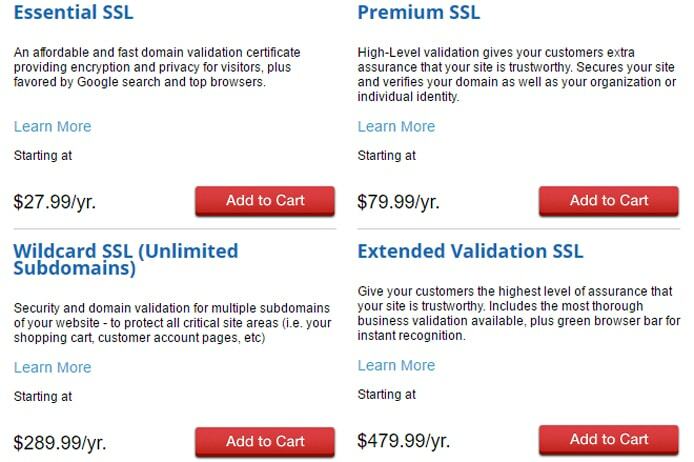 If your site sells products or deals with sensitive customer or patient data, you probably need SSL encryption. If you’re just blogging or your website is strictly content-based, you may still be among the folks who forgo a certificate for performance reasons. For Ignite Online Marketing, Call 1-800-986-1477: Get noticed by Bing, Google, Yahoo!, Yellow Pages, and other online search platforms. For Facebook Boost By Web.com, Call 1-855-897-1728: Social media experts spur conversations about your business and help you create a following. For SEO and Paid Search Marketing Services, Call 1-855-312-9167: SEO gurus will optimize your content with keyword research, build links to your site, and conduct other efforts to push your website up the ranks in search results. PPC (pay-per-click) experts will create a custom ad strategy for your site, track results, and handle ongoing campaigns. For Local Lead Generation, Call 855-817-4547: Web.com experts will work their magic to get your business found in the top of local search results, generating nearby customer leads. Pricing for these marketing services is not advertised, with the exception of the national and local SEO services, which start at $300 per month. Nestled in the metropolitan hub that is northeast Jax, Web.com is no stranger to what it takes to launch and grow a successful business. As such, the company’s services cater to full lifecycle development of professional websites. The team has all the bases covered — from initial design and domains to content optimization and paid search — however, we find the renewal fees and marketing services to be a bit costly compared to those of competitors. The company offers an excellent startup deal, but there are more economical hosts that offer long-term value. While Web.com is one of our top-recommended hosts for affordability, it’s not our first choice.